A sequel to the WiiWare title, Pokémon Rumble. 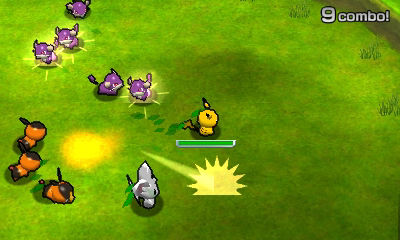 The player takes control of small, wind-up toy versions of Pokémon, using attacks to wear down the HP of enemy Pokémon. Once you defeat them, they are added to your gallery and you can use them in order to face bigger and stronger Pokémon in the game's dungeons. After clearing dungeons, you unlock more areas on the world map, allowing you to explore new areas and meet new Pokémon. Using the 3DS StreetPass feature, you can see the Miis and Pokémon galleries of other players.